Is it a moral obligation to return foreign artifacts to their place of origin? Yesterday on the news, I refused to watch the whole video of ISIS members ransacking and sledgehammering priceless Mesopotamian artifacts in Mosul. It was simply too much. A few days ago, more than 100,000 books and manuscripts were burnt, extinguishing in a single blow, centuries of culture. “The birthplace of human civilisation … is being destroyed”, said Kino Gabriel, a leader of the Syriac Military Council, a Christian militia. 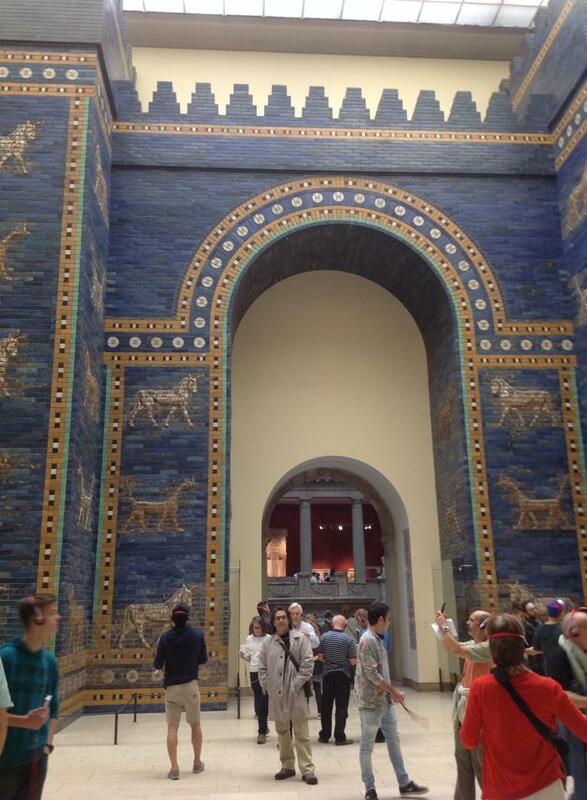 Last October, facing the Ishtar Gate of Babylon in Berlin’s Pergamon Museum I was stunned by its sheer beauty. I spent one hour admiring the enameled brick rampart from its foundations to crenellation. Not only the Gate was there, but also dozens of feet of the Babylon’s Procession Street leading to it; and further, many rooms of fine exquisite Assyrian sculpture, the finest that I have seen. It was just incredible! I knew that the Gate was in Berlin, the primary reason we flew there after Studio Italia, our painting workshop in Italy. But the question remained: “How come Berlin managed to have it?” This because in 1898, German archaeologists worked at the site for 20 years, until the outbreak of the First World War. You may refer to this Guardian article for a brief explanation. Let’s not forget that at the time, Iraq was still a country as described in the tales of the Thousand and One Nights. Was the Gate acquired in “dubious circumstances”? This is one question. In 2002, Iraq appeals to Berlin for the return of the Ishtar gate. Is it a moral obligation to return foreign artifacts to their place of origin? This is another one. Basing myself on what I saw last night on CNN and Aljazeera, the answer to the last question is simply a resounding “no”. Of course, wealthy countries have much more capacity to protect and restore historical artefacts than their countries of origin if the latter are undergoing war. Moreover, and most important, you need durable peace, people cohesion and at this moment (as it has been for the last 2000 years) there is none. Only when Sunni, Shia, Kurds, and all others will get together, then Iraq will be a strong political and cultural entity. Our moral obligation is to preserve the artefact for future generations, and at this moment, Mesopotamian artifacts remain safer in the hands of cultural institutions in Berlin, Paris, London and New York. Previous Previous post: The Art Establishment is here to stay.